The official Disney Parks blog has been updated once more to include additional details and photos regarding the soon to re-open Space Mountain. We have more details to share about the Space Mountain attraction at Walt Disney World’s Magic Kingdom Park as renovation work wraps up. As you know, the classic Space Mountain experience still exists — it’s just being updated with new technology and 21st century gadgetry. Inside the attraction, there’s new lighting as well as special “darkening” effects. And you’ll see updated color schemes for rocket capsules, line and load areas. 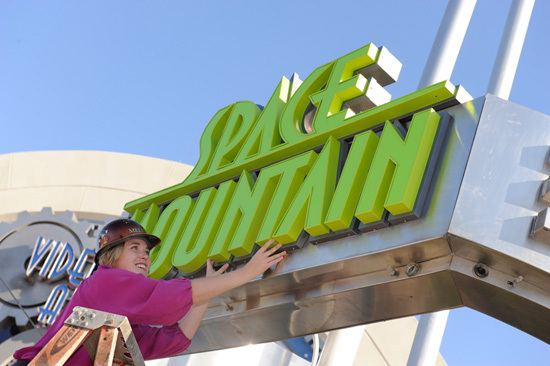 Imagineers worked with Walt Disney World Facilities Asset Management for even more enhancements, including new paint, carpet, seat fabric and other décor elements. But what caught my attention during a recent walkthrough were details about track upgrades. It’s the same track layout and overall look and feel but workers integrated new technology into the track while not changing the classic Space Mountain ride experience. “As technology evolves, it helps us enhance those elements without losing any essence of the attraction,” Walt Disney Imagineering Senior Show Designer Alex Wright says. 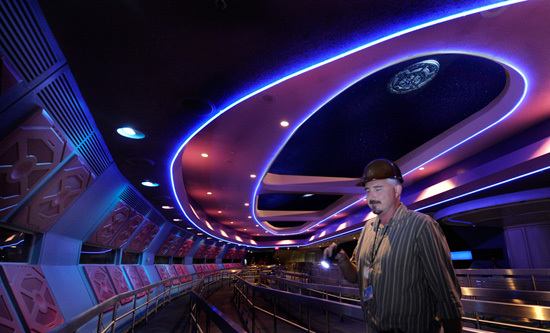 You should also know that a ride photo system will capture guests during their space flights on Space Mountain. It’ll utilize Disney’s Photopass, allowing you to access, share and purchase photos during and after a visit. Alex says he thinks you’ll be “pleasantly surprised” with the enhancements. The attraction is scheduled to reopen on November 22. Let us know what you think in the comments. ^ Is that Guy Fieri??? In Space Mountain?!?!? ^That is the Imagineer, Alex Wright. "Oh crap, we forgot to take a picture of you guys installing the sign. Alright, just awkwardly touch the sign like you're hanging a picture frame. Perfect." ^What!?!?!? That photo has been faked? More photos and a video of soft opening here, because who doesn't like a soft opening, right? Scott "stupid air gates" B.
BeemerBoy wrote: More photos and a video of soft opening here, because who doesn't like a soft opening, right? I think they put a much bigger emphasis on a commercial space flight story with the update and the way they did everything. Does anyone else forsee those video games causing huge line backups and massive amounts of line jumping? It confuses me as to why Disney would put those in their, seeing as they are always focused on efficiency. ^ I was thinking the same thing. The part I hate are the people who think they are the only ones in line. I always get stuck behing them. Like when your in a line that only has a few shady spots. The idiots stay in the shade until the line moves all the way to next shady spot and then they move, which means you are in the sun the entire time, and complaining is utterly useless with these people. I could see the same thing here. People will play the game while the line moves way down, and then will move, causing a bunch of people to miss playing it. This is the one place where I wouldn't care if people line cut. This is exactly the kind of refurbishment Space Mountain was long overdo for, IMO. They kept the original ride layout which is classic and original, and altered the rest of the minor things in the ride that really needed some work. The covered queues; making the ride darker, the slightly modified standby queue, the exit ramp, and even the ride's controls system. To which my knowledge, if I am correct, runs like Magnum XL-200, where if you get "set up" you have to run to blocks and release them manually with switches or keys... not fun, trust me. This is now functional through controls, which will decrease the amount of downtime a lot. I'm excited to be back and be ale to ride this! I will definitely be going back to ride this, as I have missed soft openings.